Let’s nip back down to South America for a quick sampling of a few tasty Chilean delights. I haven’t written about Chilean wines in awhile, so I appreciate the good folks at Feast PR for giving me the opportunity to try a few bottles from Montes, one of the leading producers of Chilean wines. Kaiken 2012 “Terroir Series” Torrontes – This wine, from the Argentina side of the mountains, is a decent sipper if you like wines with a pretty bouquet. I found it very strongly fragrant without being so perfumey as to be overpowering. It’s got a lovely nose of pears and apple blossoms. The body is medium-weight, and it wasn’t as fruity as I expected after the big ol’ nose. In fact, I thought it was almost bitter at first taste with a flavor of lemon rind, but that quickly passes into a softer fruit middle of limes and green apples. The finish is a little grapefruity and it lasts for quite awhile. It reminds me a bit of a viognier, except a little more acidic. It’s OK, especially with lighter meals or to file away for when the temperatures pick up. $13. 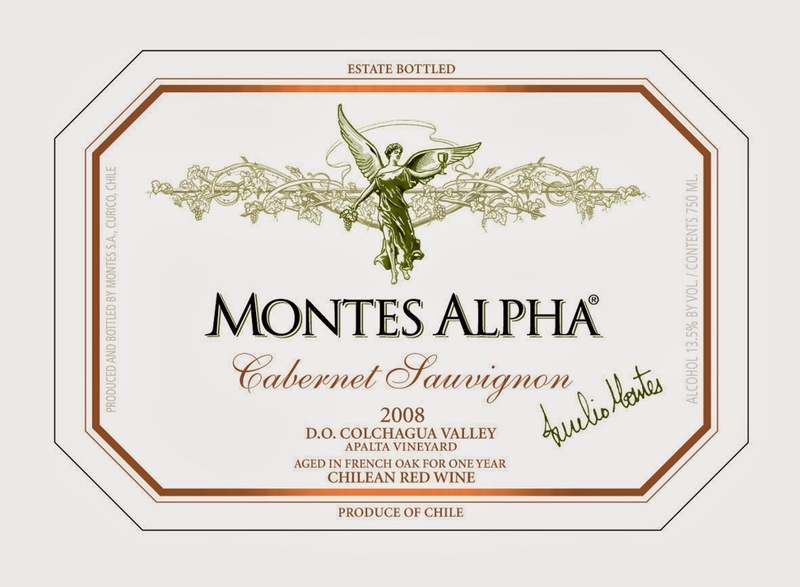 Montes Alpha 2011 Cabernet Sauvignon – The latest vintage of the wine that started it all for Montes. I’ll just state up front that I liked this wine a lot. It’s a much more Old World styled cabernet than I was expecting. I got a nose of vanilla and smoke that led into a palate of dark plums, leather, and graphite. There’s a bunch of tannin here, but it’s balanced, smooth throughout to the finish, which is graphite-y and hangs around for a long time. It’s very elegant and nicely balanced. When I poured it, The French-funk loving SPinC was expecting a real fruit bomb, and was pleasantly surprised to get this instead. With both a dinner of flank steak and roasted sweet potatoes and with evening chocolate, a very solid bottle. Recommended. It’s a little higher in price than usual, $25, but it’s worth it if you're looking for a nicer bottle. Montes 2012 Cherub Rosé – Easy to find on the shelf with its Ralph Steadman-designed label. (If you’ve read anything by Hunter S. Thompson, you know Steadman’s work.) If you’ve come looking for a light, crisp rosé, you’ve come to the wrong place. This pink one made from 100% Syrah pours bright sunset pink and has full, solid weight on the palate. The nose is very light and slightly floral. The flavor reminded me of a dry version of cranberry juice, right through the midpalate and into the finish, which has a bit of a tart cranberryish note to it. There’s also some considerable acidity. This combination of slight bitterness and acidity makes it a much better food wine than one to sip on its own, but it’s a good match for a wide range of food, including some that might overwhelm whites but get buried by reds, like spicy Asian or Mexican dishes. If subtlety and balance is what you want in a pink wine, head for Provence. If you want one that drinks like more like a red, try this. $15. The Alphabet Soup Project -- "O" is for "Oak"